Do you know a child who dreams of trucks and is constantly obsessed with construction? West Berlin, N.J.'s Diggerland USA is a paradise for kids to play in and on all things road crew, including plenty of full-sized construction equipment. Based on a successful series of parks in the United Kingdom, Diggerland USA is the first of its kind on this side of the pond. It is currently the #1 TripAdvisor rated attraction in West Berlin, with most reviewers giving Diggerland USA the highest rating of "excellent". The 14-acre theme park, which opened in June of 2014, features all authentic, full-size heavy construction equipment - no plastic play diggers here. 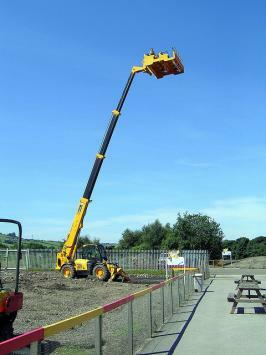 These are the real, multi-ton deal, made by the British construction manufacturer JCB (J.C. Bamford Excavators Ltd.), but they are modified for safe fun. The adult reviewers on TripAdvisor commented on how much fun they had right alongside their child with the unique chance to drive the equipment. Diggerland USA offers more than 23 attractions and is not just for the pre-school set. This is beyond "Bob the Builder." In fact, most rides have a minimum height requirement of at least 42 inches. There are multiple tiers for height restrictions; check the website first for full details. Some of the highlighted rides include the following. Dumper Trucks - Steer a 1,300-pound dump truck around a specially designed obstacle course. Children and adults 48 inches and taller can enjoy these fun rides. In most cases, kids over 36 inches and under 48 inches may ride on an adult's lap. Spin Dizzy - In the park's most famous attraction, a row of eight brave riders are strapped into the shovel "scoop" part of an excavator, lifted high in the air and spun around 360 degrees. 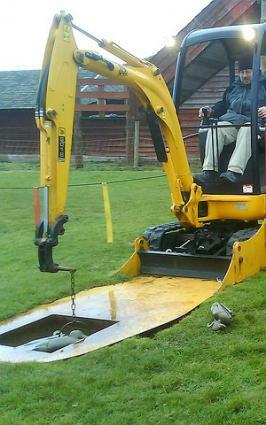 Giant Diggers - This attraction boasts full-sized excavators that riders can really drive, operate, and of course dig! Skid Steers - Here, you can maneuver the modified Bobcat loaders through an obstacle course for operators big and small. Backhoe Adventure - Four riders join a Diggerland Ride Marshal in the cab of a modified backhoe and take turns steering along a coned course for what the park calls a "mystery tour". Operation Battle Truck - Oversized Army-jeep-like vehicles take groups off-roading, 16 passengers at a time. Sky Shuttle - This attraction features a forklift-like machine that lifts riders 50 feet up high above the park. Ground Shuttle - This is a similar vehicle to the Sky Shuttle, only the boom extends riders six and a half feet off the ground. Rope Course - Kids can climb to their hearts' content on this four-story ropes course and two-story rock wall. These rides and attractions are for guest who are at least 42 inches tall. Kids between 36 inches and 42 inches may participate when an adult accompanies them. Dig-A-Round - A carousel of sorts, this ride circles pairs of riders forward and backward in bucket swing seats attached to a central excavator. Big Diggers - This is the smaller-sized version of the Giant Diggers ride; this supervised ride allows children to dig and drive in the dirt. Dippy Ducks - Use the arm to grab toy floating toy ducks from a pond. Treasure - Attempt to dig up buried treasure bricks from a sand pit. Bowlers - Try knocking down pins with the attached mini bowling ball at the end of the excavator's arm. Mini Land Rovers - Jr. drivers can operate miniature Land Rovers around a free-form course. Maximum height: 55 inches tall. Even though many of the attractions at Diggerland USA are aimed at older kids, younger children can still enjoy the following fun attractions. In fact, kids under 36 inches get to enjoy free admission to the park. 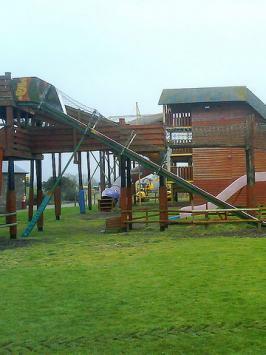 KidZone - This is an unsupervised playground area with tubes and slides. Excavation Center Arcade - There's lots to do at this 3,000-square-foot, air-conditioned video-gaming arcade pavilion. Smiling Barrel Train - This train, pulled by a dump truck, has no minimum height required, but kids must be able to sit upright on their own. Skilled equipment operators strut their stuff in a stunt show under the direction of "Backhoe Brandon," a professional employed by the park. Backhoes bending over backward is just one of the antics you'll see in this crazy construction-trucks-gone-wild showcase. No set schedule has been announced, but the website indicates they perform daily. There is just one food outlet on-site: the Dig Inn. This family-friendly eatery serves up typical amusement park fare - chicken fingers, fries, pizzas, sandwiches, burgers and the like. No outside food or beverages are admitted at Diggerland USA, so it is the only option. Many reviewers on TripAdvisor mentioned the cleanliness of this newly-opened park. In August 2014, Diggerland USA was featured in the New York Times "Region" section highlighting New Jersey Labor Day activities for young families. Reviews of the park are scarce since this is a new attraction. Diggerland USA is open every weekend through December from 11:00 a.m. to 5:00 p.m. It is closed January and February; the 2015 season schedule hasn't been determined beyond that. It is a fully outdoor park that operates seasonally, dependent on the weather. Non-participating guests over age 65 years and children under 36 inches tall are admitted free. All guests receive a wristband at the entrance, allowing re-entry throughout the day. This means you can leave the park to eat off-site at a local restaurant or give the kids a mid-day nap and return without having to pay again. You don't have to wear any special clothing. 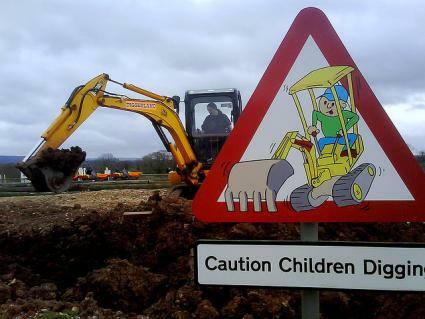 Despite being a glorified construction site, Diggerland USA maintains that guests won't get dirty and that its rides are clean. Much of the park is paved, so sturdy footwear is a good idea. The single-day regular season admission price for Diggerland USA is $34.95 for all guests over 36 inches tall. The end-of-the-year special is $24.95 for weekends and special days throughout the rest of 2014. You may purchase tickets online. Combination ticket packages for entry to to the nearby Sahara Sam's indoor/outdoor water park and Diggerland USA are $49.50. The package consists of two separate tickets. You must select a specific date for the water park; the Diggerland USA ticket is for use any day the park is open. 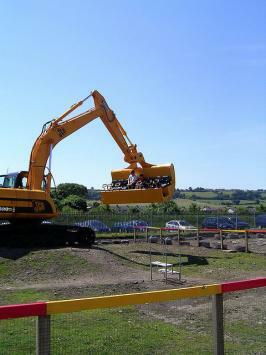 Diggerland offers young families the rare opportunity for hands-on fun with real vehicles. If your child's fantasy is a day in the dirt with 'dozers, dumpers, tractors and more, truck out to South Jersey. This is a great place to celebrate all things construction.